The Curious Case of the iPad Shipment "Collapse"
My last post on NPD's display shipment estimate seems to have kicked up quite a storm. Some didn't seem to buy the production cuts argument as a rationale for a drop in sales. The goal of this post is to show that the potential collapse in 9.7" iPad sales is not just realistic, it should be expected. 1) Rising Yield Rates - Yield rates have not been an issue for the 9.7 inch iPad or its displays, so it seems to be an unlikely cause of the drop in production. If this crash was related to the iPad Mini, we would probably need to look at this more closely. 2) Change in the iPad's Screen Size - There's very little reason to do so (fragmentation concerns, etc. ), and even if such a move was being considered, there would have been numerous supply chain leaks about the change. 3) Change in Display Manufacturers - There have been many reports of production cuts of the iPad's display, but NPD's data is different because of one crucial reason - Previous reports only gauged production cuts at a single or a few suppliers, while NPD's data tracks the industry as a whole. Therefore, we can eliminate this possibility. 4) Drop in Sell-Through - The only other possibility is a drop in sell-through rate of the 9.7" iPad. This would have resulted in inventory build-up in the channel, which would have necessitated a production cut. Since the drop in display shipments was sudden and not gradual, it implies that Apple had forecasted higher sales for the 9.7" iPad. Most iPad Mini shipments estimates, for Q4 2012, range between 7-10 million. Using a mean figure of 8.5 million, I've constructed the shipment chart above. 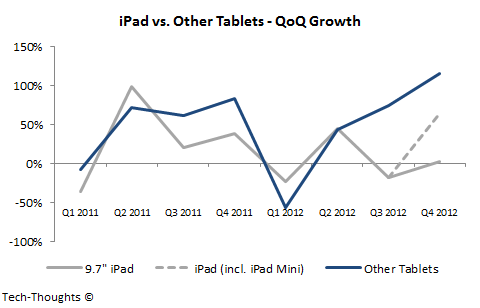 As we can see, the iPad's QoQ growth pattern over the last two quarters really highlights the impact of the iPad Mini. Q3 sales were depressed as consumers held out for the iPad Mini, but strangely, the shipments of the 9.7" iPad didn't really recover in Q4 (from an already low base). This wasn't an industry-wide phenomenon as shipments of the iPad Mini and Android tablets remained strong. This is something I had predicted in my cannibalization estimate, although not to this degree. As the chart shows, Q1 tablet shipments tend to be considerably weaker than Q4 shipments. Based on last year's figures, I expected the market to shrink significantly. NPD's data suggests that rising emerging market demand (which is relatively less cyclical) is beginning to make up for cyclicality in mature markets. The overall market will still decline, but possibly not as much as it did last year. Based on my previous Q1 iPad shipment estimate of 17 million, the iPad Mini is likely to make up 7-8 million units (for a 10-15% QoQ decline). This implies that 9.7" iPad shipments would drop below 10 million units - the lowest figure since Q2 2011, i.e. since the launch of the original iPad 2. The primary issue is that the iPad Mini seems to be too expensive to take a large chunk of sales away from cheaper Android tablets, but is still a good value proposition to potential iPad buyers. This limits market expansion potential, while increasing cannibalization. The iPad's ASP in Q1 was a very strong hint of this dynamic and NPD's data suggests that the iPad's ASP in Q2 could be even lower. Your chart, showing QoQ growth, is incredibly misrepresentative. While I'm not going to waste my time looking up actual figures (that should have been your job), the chart strongly implies that "other tablets" are vastly outselling iPads. This is simply not true. They are only increasing QoQ sales when compared to their own dismal and minimal sales in the previous quarter. Show the actual sell-through numbers and that chart would be vastly different. Oh wait. You can't do that. Neither Samsung nor Google will release the actual sell-through numbers. I wonder why that is? I've included both the shipment and QoQ growth charts. 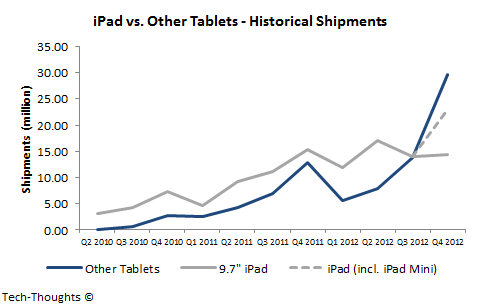 Both charts clearly show that shipments of "other tablets" overtook the iPad this past Q4. None of this is "misrepresentative". I find it incredibly amusing that so little is understood of the relationship between shipments and sales, even after I explained it in the first half of the post. Rising sequential QoQ shipment growth is impossible with low sell-through rates. Why? Because low sell-through rates drive inventory build-ups in the channel and no retailer would order more of these tablets if he has a ton of them collecting dust on his shelves. Whenever sell-through rate is lower than shipments, you see an immediate, sharp drop in shipments in the following quarter. That's what happened to the Kindle fire in Q1 2012 and seems to be happening to the 9.7" iPad this quarter. I like how you manage to use Apple's actual sales to build a picture of the whole tablet market when you have zero data for other tablet sales. If you use 'shipments' only, then surely the market as a whole is shrinking and in this scenario, Apple's share is increasing. Nice try at dodging the issue. Neither Samsung nor Google give actual sales data. That I way I used terms such as "sales." I did not mention shipments. They can ship a billion tablets, but unless they sell it's just hardware in a stockroom. So I repeat, what is it that neither Samsung nor google will release actual sell-through numbers? Is it so that people such as yourself will misrepresent the truth with deceptive numbers? Sameer, can you please clarify the source of data for your first chart. I presume the Apple data is from their quarterly reports. What about the Android/Windows shipments? Also using "Growth Rates" is entirely misleading when talking about the tablet market. When Apple's Mac lines began significantly selling more units per quarter YOY, news of this dismissed because when compared to the entire PC market on the whole it was a drop in the (5-10%) bucket. So Android tablets have shipped twice (or whatever) as many tablets as they did a year ago. It still comes nowhere close to amount of sales (the numbers as actually released by Apple) of iOS related tablets. Fire sales abound on unsold Android tablets and companies are pricing them as close to the bone as possible. What if any, service and support for these devices will be available a year after the purchase? History shows that few of the makers are interested in easily allowing updates since added functionality means the buyer might not buy another one as quickly. Since Google seems to have little control over what the manufacturers actually install on these devices (including tablets) only the techies will be able to easily update them. That does not encourage repeat sales. You do realize that Apple reports shipments, not sales - nobody has data on actual sales other than the companies themselves. The data on "other tablets" is highlighted just to illustrate Apple's position. My projection of Q1 iPad sales is based purely on historical iPad shipments and that shows that 9.7" iPad shipments are going to be the lowest in two years. The numbers released by Apple are shipments, not sales. Even a cursory glance at Apple's quarterly reports will tell you that. As far as repeat sales are concerned, I've linked to my projections in this post. It will be interesting to see how accurate they are. 1. Apple reports shipments, not sales. Reading the quarterly reports might help clarifying this. 2. Companies rarely ever release operational data for non-core businesses (Amazon) or subsidiaries (Samsung's Mobile division), so I find the incessant attacks amusing. On the contrary, pure consumer hardware companies (Asus) do release shipment data. Nexus 7 shipment data would be included with Asus' figures and not Google's (Google's role in the supply chain is limited to distribution). 3. Apply your comments to the smartphone industry. Since only reported figures count, I guess the leaders are still Apple, Nokia & Blackberry. Your comments remind me of the early days of the smartphone industry. You must be the only person on the planet who thinks the numbers Apple reports as 'sold' are really shipments. Do you think they are lying?...in contravention of reporting rules? It's hard to avoid the impression that you have an agenda here. "Virtually all of the $2.2 billion sequential revenue decline, was due to iPhone sales in Greater China and about half of that $2.2 billion is attributable to changes in the channel inventory not the underlying sell through of the iPhone." If Apple's reported figures were a factor of channel sales and not sell-through rate, then Apple's reported figures are channel sales (commonly referred to as shipments). Apple has just as much or as little info as any other company does once the products are sold to a retailer (apart from Apple stores, of course). This isn't in contravention of reporting rules because the terms "shipments" or "sales" aren't defined by the SEC. A sale into the channel is considered a sale by most companies, it is only research firms that make a distinction.